Is it fair to say the mention of taxes induces at least a hint of anxiety in nearly everybody? That’s why a lot of us put it off — including myself. But don’t worry: The Penny Hoarder has you covered. Because as important as it is to make and save those pennies, it’s equally important to do your taxes. And you don’t want to miss out on your refund, right? Here are four steps and 25 things you need to know about how to file taxes. Hopefully, it will help you survive tax season. Take a deep breath… now exhale. If you’re in the mood, break out a bottle of wine. We suggest something white, so there are no stains if things get messy. First things first: Do you even have to file taxes? The answer is probably yes, but if you want to make sure before you chug that full bottle of wine, writer Lisa McGreevy will let you know. Bonus: There’s a link to an interactive quiz at the end. In about 12 minutes, you’ll know the answer to this pressing question. If you answered “no” to the above question, why are you still here? If you answered “yes,” break out your planner and a big red pen. Circle April 18 on the calendar. Check out what exactly the IRS needs from you by then, and learn more about how to file for an extension if you need one. If you’re self-employed, you must file taxes four times a year: April 18, June 15, Sept. 15 and Jan. 17. Before you continue, a word of caution: Tax season is a golden opportunity for scammers to prey on unsuspecting individuals; many are easy targets because they were too trusting or too intimidated by tax lingo. Learn more about common tax season scams and how you can avoid them. So far, you’ve determined you need to file a tax return, and you have your deadline set in stone. Now, you need to gather all of your materials. Be patient for this part because you need all of your forms before you file — or else it’s just a waste of time. A big part of your paperwork will likely include a W-2 form (or forms), which your employer should have mailed to you by Jan. 31. Still haven’t found those forms in your inbox or mailbox? Call the number listed in the link above. What’s the Difference Between a W-2 and a W-4? What’s the difference between a W-2 and a W-4? Is that a silly question? We sure hope not because some of us had the same question. Here’s your quick explainer — and why it even matters. Wait, wait, wait. Have you moved in the past year? You’ll need to change your address with the IRS so you don’t miss your tax return. The whole process is a lot easier than you might think, and we’ve outlined exactly what you need to do. Step 2: Decide How You Want to File Your Taxes. You have some choices here. You can take the do-it-yourself route, use a free online tool or leave it to a professional. If you’re not quite sure what your best course of action is, stop Googling questions that are way too long, and use this straightforward advice. But when it comes to taxes, DIY could be the right route. Before you dive into the deep end, decide whether it’s the right choice for you by answering five questions. Software and Services and CPAs — Oh My! Which is Right for You? If filing your own taxes is out of the question, you’ll need to decide if you want to use software, an online service or a CPA — aka a real-life person. Based on your needs and what you’re willing to spend — and how paranoid you are about the IRS knocking on your door — this guide will help you figure out your best option. A free online service may be a great option if you find DIY isn’t your best bet, but you don’t want to fork over money to a professional. Fortunately, writer Lisa Rowan found eight free filing sites that just might save your sanity. Step 3: Understand the Language of the IRS. What gets taxed? What’s a deduction? Maybe tax season has even left you wondering who you even are. (Head of household? Dependent?) Don’t worry. It’s not just you. Treat this like a dictionary. But a short one. Without super thin, easily rippable pages. What Exactly Counts as Taxable Income? So you need to know what’s actually taxable, right? This article outlines everything from salary to jury duty pay to bribes. One basic rule of thumb: “Unfortunately, the IRS views almost all money received by taxpayers as taxable income,” said Aaron Lesher, a CPA with Hurdlr. But there are a few exceptions — so hold onto that ish. What Does Head of Household Mean? You probably hear this term thrown around a lot, but do you know what it means? In short, you qualify if you’re not married on the last day of the tax year, you paid for more than half of household expenses during the year, and you have a dependent living at home. If you qualify, you could get a lower tax bill and more money in your pocket. If you can’t handle doing your own laundry, does that make you a dependent? Does the IRS consider your grown child who still steals food from your fridge a dependent? Claiming a dependent can yield you a bigger tax return. That’s why writer Lisa McGreevy spells out exactly who counts as a dependent. Plus, don’t you just want to know if you’re independent yet? Isn’t that #adulting? Now it’s time to understand credits and deductions. If you click this, don’t be embarrassed; many people don’t know the difference between the two. In short: A tax DEDUCTION reduces the amount of income you owe taxes on. A tax CREDIT reduces the amount of taxes you owe. Learn more about how they’re actually relevant to you. Because they are. Standard Vs. Itemized Deduction: Which is Best for Your Bottom Line? Understand what a tax deduction is now? You’re not done quite yet. Get familiar with standard and itemized deductions. Writer Lisa McGreevy explores the pros and cons of both. So now you know that deductions equal savings. Here are some solid examples of tax deductions that might apply to you if you opt to itemize — like charitable contributions, home office expenses and contributions to some retirement accounts. Plus: Check out the eight most commonly overlooked deductions — because who wants to miss out? Pro tip: It’s almost always better to file jointly instead of separately. We have a lot of freelance followers and serial side hustlers out there, so this one’s for you. If you’re not self-employed, and if you don’t work a side gig or do freelance work, skip to step 4. If you’re a freelancer, you might as well just dive into this beginner’s guide. It calmly walks you through the steps to take if you’re a freelancer and how to not screw everything up. If you still have wine left, this might be the time to chug. But seriously, don’t panic. 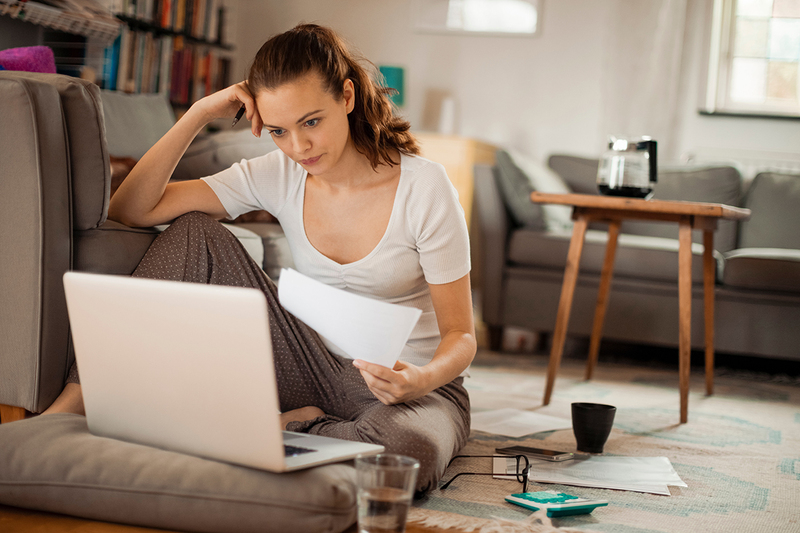 We touched on deductions above, but did you know you can get a ton of additional tax deductions if you work from home? Don’t miss out; see what qualifies here. Related: What the heck are quarterly estimated taxes? If you’re a freelancer, contractor or home-based entrepreneur, you’re going to want to get familiar with this term — and how to best handle these things. Our writer Lisa Rowan fudged up her self-employment taxes. Now, she’s admitting her expensive mistake to help you avoid owing big. Here’s how she’s fixing it and what she learned. Maybe you’re a different kind of freelancer. Maybe you work a side gig. If you drive for Uber or Lyft, you don’t get to avoid taxes. Sorry. Pro tip: Don’t wait until the last minute to tackle this. Step 4: Getting a Refund? Congrats. Owe the IRS? Here’s What to Do. Twiddle your fingers, pour another glass or three of wine, start a new hobby… Now that the hard part is done — but really, it wasn’t that hard was it?! — it’s time to wait. Senior writer Dana Sitar expects to get a nifty tax refund check of about $3,000 this year. She’s brainstormed a bunch of ways she can make that money work for her — you know, like all the experts tell you to do. Sure we might intend to use our tax refunds to better ourselves and our financial situations, but will we actually? This refreshing study says Americans will actually be kind of responsible with this year’s tax refund. But what if you complete your return and realize you owe the IRS? And what if you can’t afford to pay taxes? Don’t worry: You do have options — and we swear, they aren’t that difficult to implement. Just remember: There’s no avoiding the IRS. Ignoring your tax bill will only make things worse. Maybe you’re on the right track this year, but how did you handle your taxes in past years? If the answer is a grunt, well, you might want to go ahead and figure that ish out. We won’t judge if you messed things up in the past. We just want you to know that you could be missing out on a chunk of $1 billion. You have three years to file returns from past years and still claim a refund. So it could pay off if you learn how to file your 2013 taxes… in 2017. Your Turn: Do you have any other tax questions? Let us know, and we can tackle those for you, too!